How Powerful is Hafiz Saeed? Is Pakistani radical Islamist Hafiz Muhammad Saeed, at 61 years of age, the most powerful man in the world? Observing events of the past month, one might be justified in thinking so. Early in April, the United States government offered USD 10 million for the capture of Saeed, the leader of Lashkar-e-Taiba (LeT), the so-called "Army of the Righteous." LeT is an ally of Al-Qaida supported by the Pakistani military and intelligence services as a jihadist force against Kashmir. It has been involved in numerous terrorist conspiracies and atrocities over the years since September 11, 2001. These have included recruitment of American Muslims to fight against India, planning of the 2006 explosive chemical plot aimed at U.S. and British air traffic, and, most significantly, the deadly 2008 attack on Mumbai. Pakistan arrested and held Saeed for six months after the Mumbai massacre, and LeT reinvented itself as a supposed charity, Jama't ud-Da'wah (JuD), the "Community of Preaching." Islamabad authorities claimed they lacked sufficient evidence to try Saeed. After announcing that Jama't ud-Da'wah would be suppressed, Pakistani officials failed to carry through the ban. But the radical ideology of Saeed's following has not changed. Saeed is a key leader of the "Defense of Pakistan Council," which has agitated the country against the West and India. LeT was designated a terrorist entity by the U.S., and JuD was outlawed by the United Nations after the Mumbai raid. The organization is similarly prohibited in India, the UK, the European Union, and Australia. The U.S. government said the reward was motivated by Saeed's "brazen" public profile. The terrorist schemer obliged his accusers by acting out a voluble defiance. He declared that he was living unmolested in Lahore, and held a press conference to express his contempt for the U.S. initiative. Then, Lord Nazir Ahmed of Rotherham, a member of the British Parliament representing the Labour party, added to the atmosphere of impunity surrounding Saeed. Visiting Pakistan, Lord Ahmed reportedly proclaimed that, in response to the bounty on Saeed, Lord Ahmed would pay 10 million UK pounds for the arrest of U.S. president Barack Obama and former president George W. Bush. The Labour party suspended Lord Ahmed from his duties pending an investigation of his rhetorical antics. Lord Ahmed, a key figure in Britain's "Wahhabi lobby" of fundamentalist Muslim groups, denied he had suggested he would compensate anybody for the arrest of Obama or Bush. Lord Ahmed said he only accused Bush and former UK prime minister Tony Blair of war crimes. Blair appointed Nazir Ahmed, the first British Muslim life peer, to the Lords in 2008. Meanwhile, Jama't ud-Da'wah and Hafiz Saeed have continued their propaganda offensive. In further complication of the situation, JuD has advertised the Urdu-language program of the "Peace TV" satellite channel produced by the Indian Muslim hate preacher Zakir Naik in Mumbai, and broadcast from Dubai. The government of India has taken steps to ban "Peace TV" but enforcement of regulations against it has proven difficult. While Pakistan disclaims a capacity to arrest Hafiz Saeed on grounds that such an action would represent American interference in Pakistani internal affairs, Indian authorities argue that they cannot block "Peace TV" while it is beamed from Dubai. Obviously, the Indian position has more legitimacy than that of Pakistan. But moderate Indian Muslim leaders have pressed for action against Zakir Naik. Maulana Mufti Abdul Irfan Qadvi, the qazi of Lucknow, denounced Naik as an apostate from Islam in 2008, for supporting the late Osama Bin Laden. Maulana Qadvi appealed to the Indian government to shut down "Peace TV," and to investigate Naik's financial backing. Indian Muslims who follow spiritual Sufism were outraged when Naik condemned their devotions as heresy – a remark the television preacher later recanted. At the same time, however, Naik offended, with apparently deliberate intent, Indian Shia Muslims, by praising the killer of Imam Husayn, the grandson of Muhammad. The pretensions of Naik to standing as a Muslim scholar who can deliver fatwas [religious opinions] via television have been repudiated by other established Indian Muslim authorities. Maulana Mehmood Daryabadi, general-secretary of the All India Ulema Council, has stated of Naik: "He is neither an 'aalim' (scholar) nor a 'mufti' (one who gives fatwa)… he should not issue fatwas from public platforms." Naik's alleged fatwas and Quranic interpretations, elaborated despite his lack of appropriate religious training, are typical of Wahhabis and their followers. Wahhabis assert that their improvisation of religious doctrine represents a "reform" of Islam and a revival of "ijtihad," or individual juristic reasoning. In practice, such "individual reasoning" has served as an excuse for Wahhabis to impose unjust punishments for alleged moral infractions, as well as to support acts of terror previously forbidden in Islam. An unapologetic adherent of Wahhabism, Naik is barred from entry into Canada and Britain for exhorting Muslim youth to participate in terrorism. He asserts loudly his alleged charisma in convincing Hindus, Christians, and other believers to become Muslims. While Hafiz Saeed was engaged in his insolent performance in Lahore, Naik announced that another notorious hate advocate, the regular Friday preacher at the Grand Mosque (Haram) in Mecca, Wahhabi sheikh Abdur Rahman Al-Sudais, would join Naik in a spectacle in Dubai, styled the second "International Peace Convention." Al-Sudais claims to be an apostle of interfaith dialogue, but he has been barred from Canada and condemned by Saudi officials for his extremism. He has supported previously-unknown restrictions on the participation of women in the hajj pilgrimage to Mecca. Most offensively to moderate Muslims, Al-Sudais demands that women who go on hajj be separated from men and required to put on the un-Islamic face veil (niqab). Such demeaning proposals have never before been articulated among Muslims, who believe that women living in Mecca and attending hajj are sufficient in their virtue, and require neither covering of their faces nor segregation from men. Al-Sudais has also been an active proponent of anti-Islamic, anti-historical, and anti-cultural schemes for the desecration of Mecca by the construction of new high-rise buildings around the Grand Mosque and the Ka'bah, the most sacred Islamic structure, to which all Muslims turn in prayer. 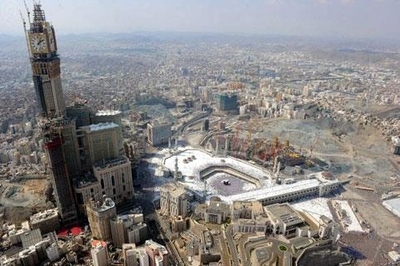 Saudi Wahhabis, obsessed with a gigantism in construction reminiscent of Stalinist Russia, have already erected a huge "royal clock tower" that overlooks the Ka'bah, and has a face even larger than the Ka'bah itself. The Mecca Royal Clock Tower. But Al-Sudais, originally promised as leader of Friday prayer at Naik's Dubai affair on April 13, and then listed as a lecturer on April 12, the first day of the show, did not participate. Friday prayer was conducted, instead, by sheikh Mishary Rashid Al-Afasi, imam of Kuwait's Grand Mosque. The message of Wahhabis such as Al-Sudais is: Saudi power transcends and dwarfs the whole of Islam. As the imam of the Meccan Grand Mosque, he may not have wanted to be overshadowed by the flamboyant Naik. But the attitude of Hafiz Saeed in Pakistan and Zakir Naik in India is guided equally by Wahhabism, holding that radical Islam must gain supremacy over the world. Investigation of the "Indian Mujahideen" by New Delhi in 2008 revealed that the terror network's members were more influenced by Naik and his video sermons than by better-known jihadist writings. Najibullah Zazi, a U.S.-based Wahhabi fanatic of Afghan origin who admitted his guilt in attempting a bombing campaign in New York, was inspired by Naik as well as the late Anwar Al-Awlaki, an American-born Al-Qaida ideologist and strategist. Zazi inveigled another Afghan, Zarain Ahmedzay, and a Bosnian-American, Adis Medjunjanin, into participating in his homicidal project. According to Zazi and Ahmedzay, they and Medjunjanin travelled to Pakistan in 2008 for training with Al-Qaida. Zazi and Ahmedzay are testifying currently against Medjunjanin in a New York proceeding. With their prolific writings, preaching, speeches, mass events, and similar activities, the Wahhabi network of Saeed, Nazir Ahmed, and Naik have proven many times over that they are enemies of interfaith cooperation and civil peace wherever they and their disciples are located. The involvement of Medjunjanin, who was born in Bosnia-Hercegovina of a Bosnian mother and a father from the Plav-Gucja area of Montenegro, was disgraceful for the Balkan Muslim communities, but the protection of Hafiz Muhammad Saeed by the Pakistani authorities is yet more detestable. If Hafiz Saeed appears as one of the most powerful individuals in the world, able to deride global anti-terrorism efforts openly, Pakistani prime minister Asif Ali Zardari seems, as in the past, to be among the weakest of global leaders.